Codie Costello directs Our Friends, The Enemy and Alexis Sheeder stars in Fancy Nancy, the Musical - these two from the Cyrano's crew stopped by KNBA to share info about the two shows. The play features a soldier-led 1914 Christmas Truce during World War I, when British and German put down their arms to join together for a holiday break including songs and games. The play is directed by Codie Costello, and was written in 2015 by Alex Gwyther. Fancy Nancy The MusicalSaturday, December 16, 2017 1:00 pmSaturday, December 16, 2017 3:00 pmSunday, December 17, 2017 1:00 pm Fancy Nancy the Musical continues this weekend, this family friendly play is based on a popular children’s book series by Jane O'Connor. Fancy Nancy and her friends are going to perform in their very first show. Nancy, played by Cyrano's versatile Alexis Sheeder, has convinced herself she will be the star of the show as the Mermaid. Another actor is cast as the Mermaid, and Nancy is cast as a tree; how does she deal with this? Fancy Nancy the Musical was written in 2012 by Susan DiLallo and Danny Abosch, and is directed by Colby Bleicher. 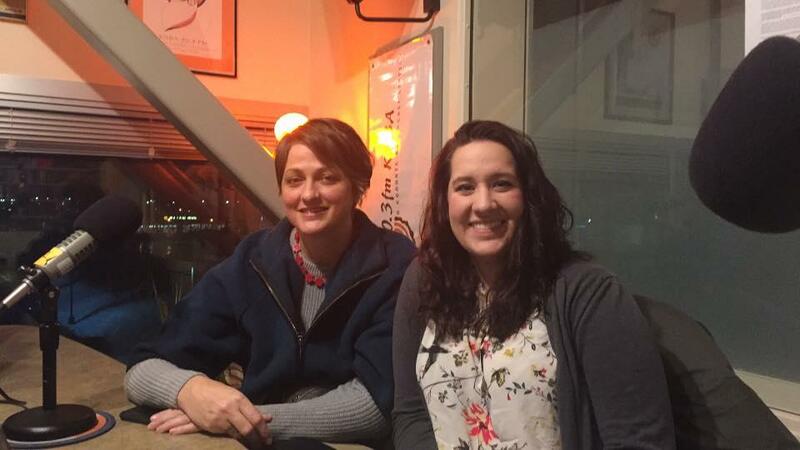 Alexis Sheeder and Codie Costello of Cyrano's visit with Morning Line's Danny Preston - Costello is directing "Our Friends, the Enemy" - as she says, a play about setting aside differences and embracing similarities. Sheeder is playing Fancy Nancy in "Fancy Nancy, the Musical" - Sheeder jokes that the role resonates with her, in that the main character gets passed over as a mermaid only to play a tree. Director Krista Schwarting and Actor Jenson Seifert came by to talk about two things - to reinforce that Cyrano's has a new location, and a play running through November 19th. The location is 3800 Debarr Road, with the nearest major intersection of Debarr and Bragaw. The play, The 39 Steps, is a comic adaptation of a classic film from the 1930s and based loosely on a 1915 era classic book. Schwarting says the treatment given by playwright Patrick Barlow not only breathes new life into the 100-year old story, but also converts it into a comedy.